Greetings from your enthusiastic WoodWeek team. Several industries in the Bay of Plenty, including wood processing, are likely to benefit from the Provincial Growth Fund’s investment of $2 million for the first stage of the Kawerau Putauaki Industrial development. The project is the result of more than a decade of planning and is expected to create at least 150 jobs. Rotorua-based Red Stag Timber is about to embark on several building projects to showcase the potential of timber as a construction material in large-scale building projects. The newly developed building projects come ahead of plans to build a $35 million cross laminated timber (CLT) manufacturing plant set to be operational in 2019. While planting more trees is usually the focus of our news, there is also a lot of work going on to remove ones we don't want. Millions of hectares of productive and precious land have been cleared of New Zealand’s number one weed, wilding conifers, but more work is needed, according to our Biosecurity Minister Damien O’Connor. “Wilding conifers are a seriously established pest in New Zealand and out-compete native plants and wildlife for light and water, infest farmland and native ecosystems and spoil the unique character of iconic natural landscapes such as the high country,” the Minister says. Meanwhile, across many of the primary industries, technology is really transforming the sector. Solving rural producers’ challenges and improving productivity through technology are key themes at MobileTECH 2019 coming in April. Now in its 7th year, MobileTECH brings together the agritech leaders, tech developers, industry corporates and early adopters to Rotorua. 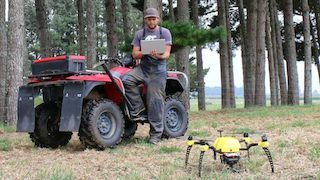 “New Zealand’s agritech sector is quickly expanding and the technology is world-class,” says Ken Wilson, programme manager for MobileTECH 2019. “While we have seen some great advances in sensors and robotics, it’s the software that’s making big strides.” Registrations are open now at www.mobiletech.events. Finally, workplace safety is in the spotlight again, as work-related serious non-fatal injury rates rose in 2017 after four years of declining rates. The rate was up from 14.3 injuries per 100,000 full-time employees (FTEs) in 2016 to 16.9 in 2017. The increase was driven by a rise in serious non-fatal injuries in the construction sector. The Provincial Growth Fund (PGF) will invest $2 million for the crucial first stage of a project that will create jobs, attract new businesses to Kawerau and help boost the productivity potential of the wider Bay of Plenty region, Regional Economic Development Minister Shane Jones has announced last Friday. This announcement is the first stage of the Kawerau Putauaki Industrial development and will involve the construction of a right-hand turn bay off State Highway 34 and forms part of a multi-phase project to develop infrastructure around the development. 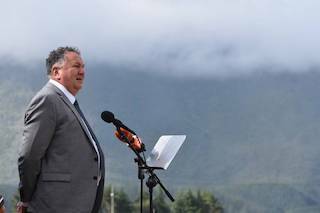 “Kawerau has always been an industry-based town and upgrading the transport and associated infrastructure will help attract new businesses and create the right environment for existing companies to invest and expand in the region,” Shane Jones said. “The project is the result of more than a decade of planning work from Putauaki Trust, council and businesses, and is expected to create at least 150 jobs in Kawerau. It also has the potential to boost the economy of the entire Eastern Bay of Plenty region. “Future phases of the project include building additional road and rail infrastructure around the industrial subdivision and constructing the Kawerau container terminal that will service the whole Eastern Bay of Plenty. “The Kawerau Putauaki Industrial Development is a good example of Government partnering with Maori, business and the community to seize unique opportunities for economic growth in the Eastern Bay of Plenty. “It is positive to see Putauaki Trust innovatively leveraging their assets to get improved returns for their people and the wider community and I look forward to seeing this project progress,” Shane Jones said. Applications for the other phases of the project are likely to be submitted once the final design and costings have been completed and will be individually assessed against the Provincial Growth Fund’s criteria. Mr O’Connor was speaking at the New Zealand Wilding Conifer Group annual conference at Omarama last week, before a helicopter tour over the Mackenzie Basin. “Wilding conifers are a seriously established pest in New Zealand and out-compete native plants and wildlife for light and water, infest farmland and native ecosystems and spoil the unique character of iconic natural landscapes such as the high country,” Damien O’Connor said. “Hardy, prolific and carried by wind, wilding conifers cover 5 per cent of our landscape and without intervention would have covered an estimated 20 per cent by 2035. “The National Wilding Conifer Control Programme has now treated half a million hectares of land and searched a further million hectares for outliers, with 40,000 hectares of dense and moderate infestation removed – meaning control work has been completed on over a quarter of affected land. “Priority areas will now be targeted across another 150,000 hectares in Canterbury, Otago, Southland, Marlborough and the Central North Island. “We know the cost of control operations increases if wildings are left to spread so early intervention is the best option. For example, treating light infestations can cost as little as $20 a hectare and dense infestations up to $2000 a hectare. “Our success to date is due largely to collaboration. Everyone from central and local government through to landowners, farmers, iwi and community trusts have got stuck in together to control the spread of these invasive trees,” Damien O’Connor said. To date, the Government has spent $12.4 million on wilding conifer control, with $5.8 million from other parties. By 2030 the programme aims to have contained or eradicated all wilding conifers. The programme is led by the Ministry for Primary Industries and is supported by the Department of Conservation, Land Information New Zealand, NZ Defence Force, NZ Transport Agency, local government, forestry and farming industries, iwi groups, landowners, researchers and community organisations. Rotorua-based timber products company Red Stag is about to embark on several building projects to showcase the potential of timber as a construction material in large-scale building projects. Red Stag is New Zealand's largest sawmiller, employing 300 people with annual turnover of $220 million. The building projects come ahead of plans to build a $35 million Cross-Laminated- Timber plant near its Whakarewarewa plant at Rotorua to be operating in 2019 and producing laminated panels up to 16.5m in length and 4.9m wide. The first project will be five-level apartments at Clearwater Resort on the northern outskirts of Christchurch using cross laminated timber, and other panel products. The Ministry of Primary Industry through its Primary Growth Partnership is covering about 8 per cent of the $20m Clearwater project. After completion of the Clearwater project there will be two in Auckland - a retail and office complex, and a hotel. 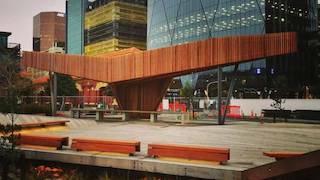 The Government was already building three-story timber structures in Auckland as part of Housing New Zealand projects, managing director of Red Stag wood solutions, Jason Cordes, said. Red Stag is also planning to expand its truss and frame operation located in Hamilton Airport's industrial park which produces frames and trusses, floor cassettes and wall panels - designs which bring floor and wall construction together in components to speed up construction. Cordes, said the New Zealand industry was on the verge of providing large scale laminated timber construction. The opportunities offered in large-scale timber construction had already been demonstrated overseas, he said. "In Christchurch we will showcase good architecture, good engineering and the best in acoustic properties and fire-resistance. We will make the whole process transparent so everyone can see how it is done and how economically viable timber can be." According to Cordes, timber construction has advantages over concrete and steel, including speed of construction, ease of transport, relative lightness, and earthquake and fire resilience. There was also evidence from psychological and physiological research concluding people found it more enjoyable to work and live in timber structures. "This sort of construction is already heavily used in Europe." At 10 stories, the Lendlease Group's 32 metre Forte Building in Melbourne was the first timber high-rise apartment structure in the Southern Hemisphere. In Canada and the UK engineers were using laminated timber in high-rise buildings of more than 10 stories and buildings of more than 30 stories are on the drawing board. In geologically shaky nations around the Pacific Rim, timber buildings resist the shock of earthquakes better than concrete and steel - as demonstrated by the former IRD building in Wellington which, although being near-new, was so damaged by the 2016 earthquakes it had to be demolished. Log export market graphics - This week we've got our monthly update (early!) from the good folks at Champion Freight. 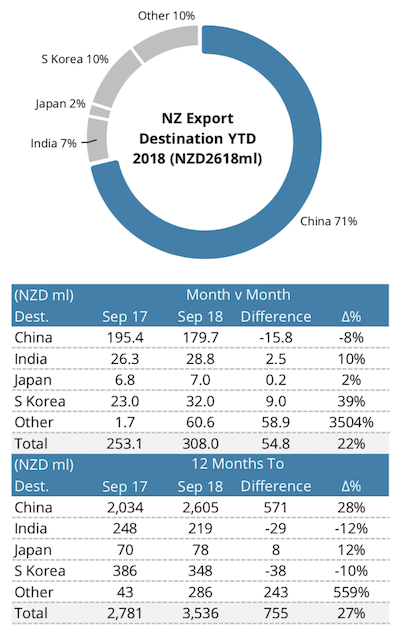 The chart shows total log export values to China to the end of September are up 28 percent year-on-year contributing to overall log exports growing 27 percent across all markets. To the end of September, China shipments month-on-month are down 8 percent and overall log exports up 22 percent. Work-related serious non-fatal injury rates rose in 2017 after four years of declining rates, according to a report just released by Statistics New Zealand. The rate was up from 14.3 injuries per 100,000 full-time employees (FTEs) in 2016 to 16.9 in 2017, higher than the government’s 2020 target (14.3 injuries per 100,000 FTEs). “This increase was largely driven by a rise in serious non-fatal injuries in the construction sector, which had the highest number of injuries in the history of this release,” government injury information manager James Clarke said. The manufacturing, and transport, postal, and warehousing sectors also significantly contributed to the increase. “Serious non-fatal injuries are those in which a patient admitted to hospital is determined to have a probability of death of 6.9 percent or more. Information about these injuries provides insight into injury risks for New Zealanders, and a broader view than just looking at fatalities,” Mr Clarke said. In 2012, the previous Government set a target to reduce work-related deaths and injuries by at least 25 percent by 2020, with an interim target of a 10 percent reduction by 2016. •	rate of work-related injuries resulting in more than a week away from work. Fatalities are reported as a three-year moving average. Provisional data showed that for 2015–17, the average annual rate of work-related fatal injuries remained at 2.1 fatalities per 100,000 FTEs. The latest data showed that the rate has been below the Government’s 2018–20 target of 2.5 injuries per 100,000 FTEs since 2012–14. Time away from work - There has been little change since 2014 in the rate of work-related injuries that resulted in more than a week away from work. This rate has been above the baseline (8.4 injuries per 1,000 FTEs) since 2014. Statistics New Zealand acknowledges the contribution of the Ministry of Business, Innovation & Employment and WorkSafe New Zealand in developing the targets in this release. Brewerton said as industry and large energy users look to implement a low- emission economy and transition to renewable energy, wood is the obvious choice. Ngai Tahu Farming will milk 14,000 dairy cows just north of Christchurch, once the remainder of Eyrewell Forest is felled. However, the South Island iwi-owned business has abandoned plans to convert some of Balmoral Forest in North Canterbury to dairy, after failing to get the required nutrient and water consents, instead focusing on beef grazing and possibly orchards. Ngai Tahu Farming (NTF) manages more than 100,000 hectares of farm and forestry land in the South Island. Its asset value had lifted from $110 million in 2010 to $440m now as properties were developed. Chief executive Andrew Priest said its 6,757 ha Te Whenua Hou dairy development, north of the Waimakariri River, would continue as trees were cleared from Eyrewell Forest. It had eight dairy farms, six dairy support and six grazing, but planned to expand this to 14 dairy farms and six dairy support, carrying a total of 14,000 cows. Its 9,400 ha Balmoral Forest, near Culverden, was being converted to beef grazing and possibly horticulture, in a longer term development. It had 1,500 ha under centre pivot irrigation and had consents for enough water to extend this to 3,000 ha. The development was new, with a pilot farm started in 2016 and beef farms in 2017. In a trial orchard started this year, it was testing the suitability of four apple varieties, apricots, peaches, almonds, olives and truffle-infused oaks for a potential horticultural venture. NTF also manages three high country stations, Routeburn, Greenstone and Elfin Bay, totalling 35,500 ha near the head of Lake Wakatipu, as well as 49,000 ha of West Coast forest (formerly Timberlands). International forestry experts to gather in Rotorua - Forestry experts from all over the world will arrive in Rotorua this week to meet with New Zealand's forestry stakeholders. The Tree Plantations in the Landscape (TPL) event will focus on the role of tree plantations in the New Zealand economy and the resulting social and environmental impacts, building on issues raised from earlier TPL events in Brazil and Chile. Participants will discuss new pathways to advance Maori forestry, sustainably increase forest production, and the use of planted forests as a means to mitigate climate change. Discussions will also take place around the Government's billion tree planting initiative and optimising land use to maximise production and environmental benefits. Event organiser, Scion principal scientist and Toi Ohomai's Sustainable Forestry chairman Dr Tim Payn, said forestry had a bright future in New Zealand but there were challenges and opportunities to be faced so the industry could reach its full potential. "There are many stakeholders in the planted forest industry in New Zealand, and many opportunities to work together to realise the opportunities – this event is a great opportunity to learn from international planted forest experts and share our knowledge with them," he said. At the national level the field dialogue will help strengthen a stakeholder network of key leaders from government, Maori, the forest sector, certification bodies, and the public to support policy initiatives around tree plantations in the landscape. Okay, it's only Wednesday already - but maybe this will boost your productivity - a joke or two ... ! In one USA county, an epidemic of roaming dogs became so widespread the dog patrol folks had to enlist the support of local police to help reign in the problem. During a state-wide drive to round up all unlicensed dogs, a patrolman signalled a car to pull over to the curb. "Oh, no," the man said, "He doesn't need one; I always do the driving." I went busking with a pencil and a sketchpad the other day. Didn't earn any money, but I did manage to draw a crowd. I've just been diagnosed as being colour blind by my doctor. I can't believe it ... it just came right out of the green. I got in a fight with a tough and angry amputee the other day. "What makes you think you can beat me?” he said. My art teacher told me to sketch a picture of a horse and buggy. When I was finished, the teacher noticed my horse, but asked where the buggy was. "Oh," I said, "the horse will draw that." Life advice: Always borrow money from a pessimist - they don't expect it back.